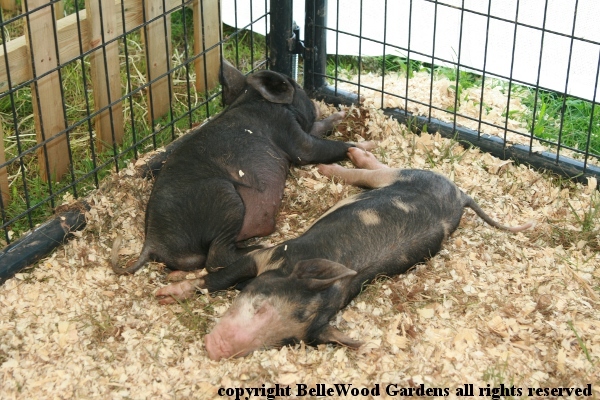 Something to look forward to, going to the fair. 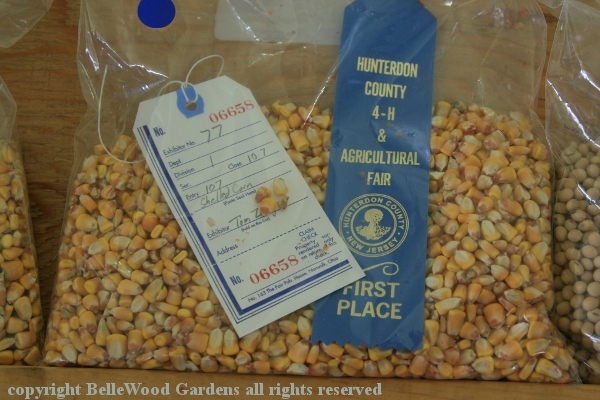 Every year, late in August, Hunterdon County's rural roots make themselves known with the 4-H fair. 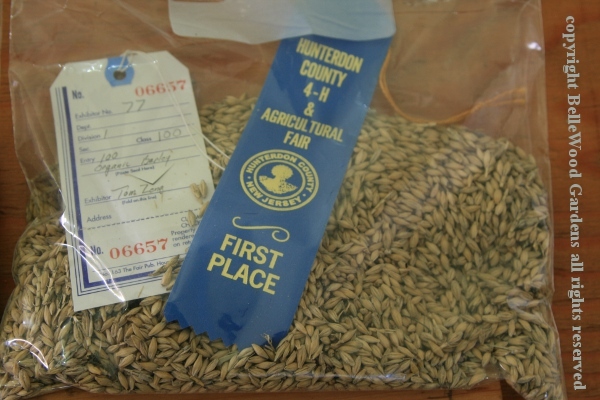 It's amazing how popular this event is with farmers, non-farmers, young and old. 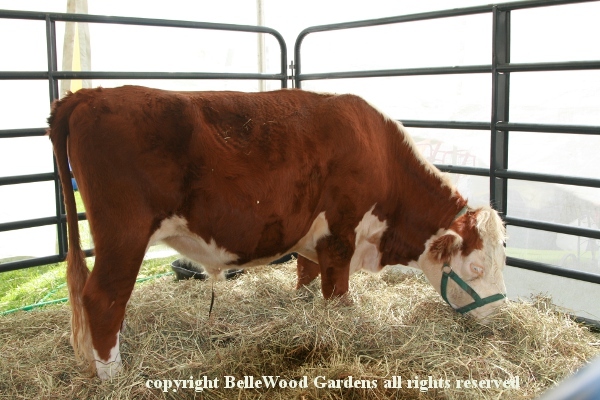 There's livestock raised by the 4-H members, competitions for vegetables and fruit, preserves and honey, handicrafts and more. The usual fair food, entertainment, vendors of tractors and more. 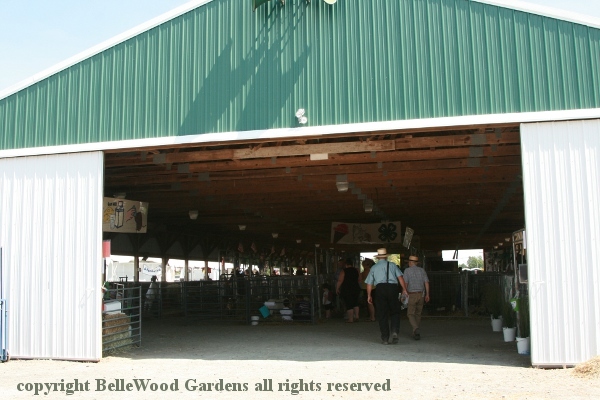 Come on, let's go inside one of the big livestock buildings. This one is for goats. 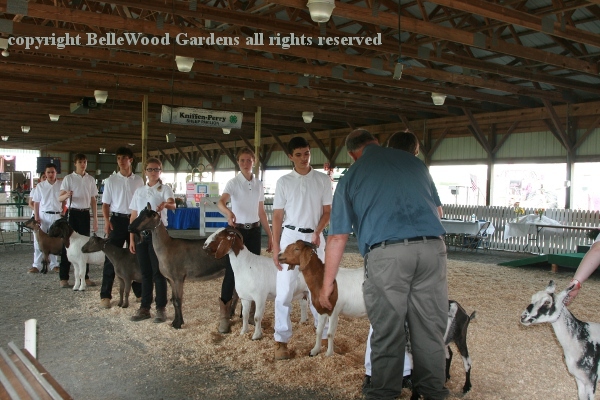 Judging going on in the show ring. Have your animal trained to pose, lead, behave. Always stand on the side of your animal opposite to the judge. Handlers wear white. The audience watches closely. Another barn houses the sheep. There are pens where the animals stay when not being shown. Signs name the farm, the breed, the animal's name too. And if they are for sale. 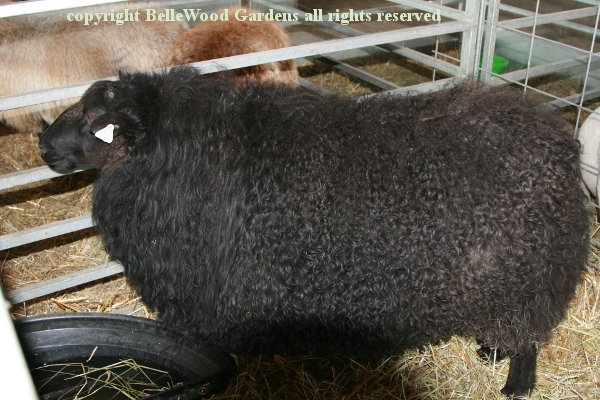 A very handsome ba ba black sheep. 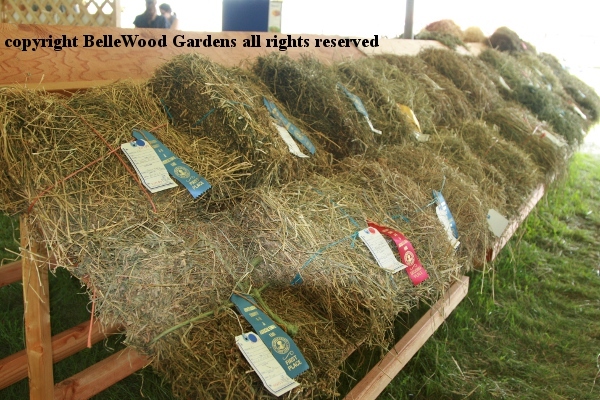 Brown Swiss heifers lining up to enter the show ring. 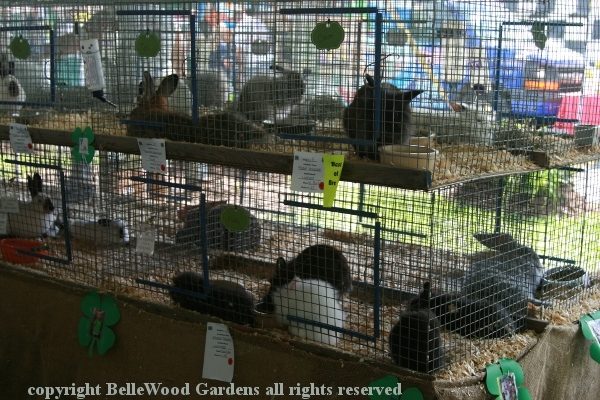 Rabbits sitting quietly in their cages, fans blowing to keep them cooler. 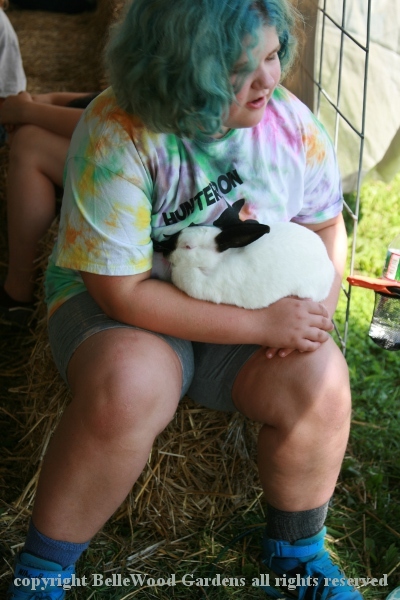 Placid little rabbit. His owner would kindly offer children the opportunity to pet him. 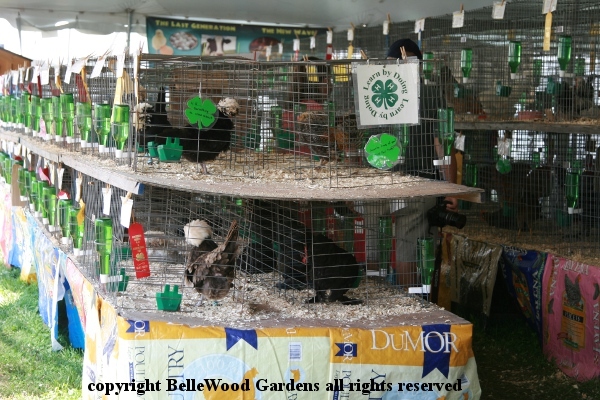 Poultry tent. So many different kinds of chickens. And some ducks. A couple of pea fowl. 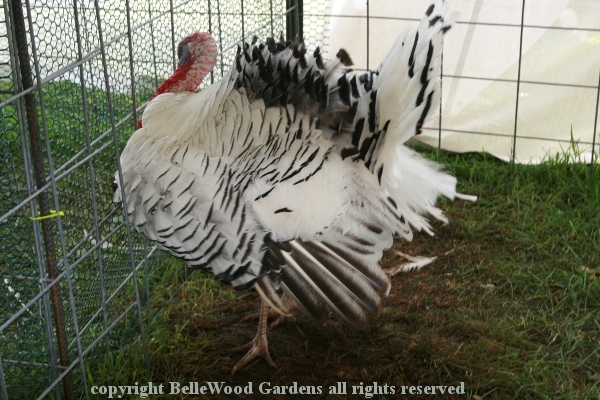 And a very handsome Royal Palm turkey. 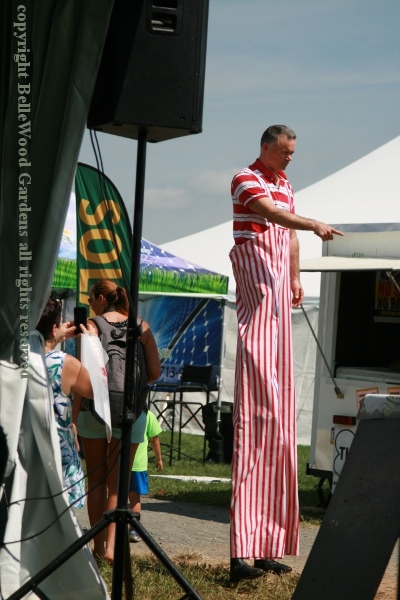 A stilt walker, entertaining the fair's visitors. 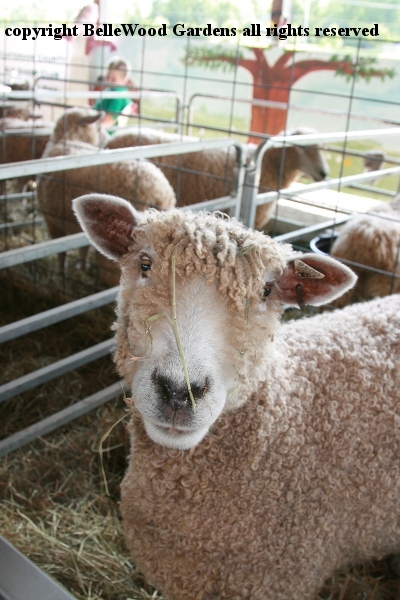 And a tent with a selection of farmyard animals to entertain the "city folk." 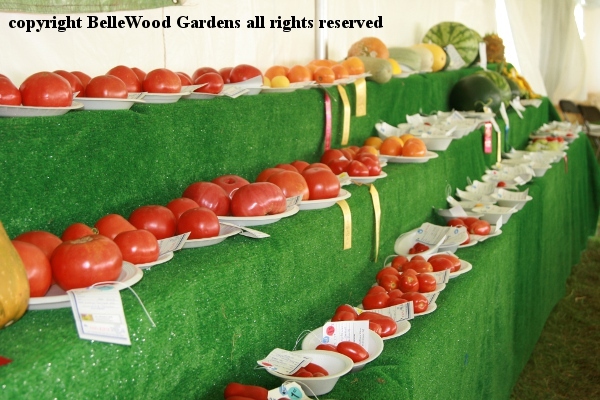 Competitions for the biggest pumpkin, best eggplants, finest tomatoes. 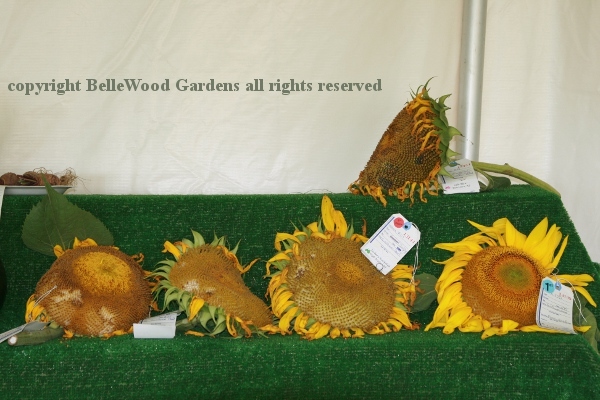 Sunflowers, Russian Mammoth. Confusing to me, some in seed and one in flower. 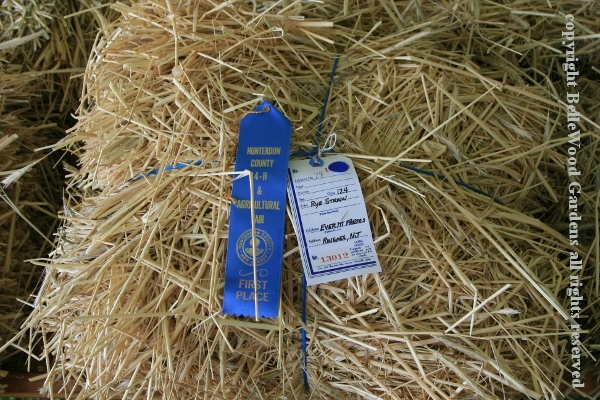 And straw, bright, clean, blue ribbon rye straw here. to organic barley. I also saw winter wheat, soybeans, and other grains. I don't remeber seeing grains in other years, and really like this class. turn and return, there's always next year to look forward to.